Tweens...not quite a teen, but too old for the kid stuff. Party ideas are tricky, because you'll be wanting something a bit more sophisticated, more on the side of teen party ideas. The slumber party, spa party and scavenger hunt are some of the favorites of tweens. Based on my own experience, here are some great, easy and fun party ideas for you to check out! You'll find lots of links here to time-tested party ideas that will be great for this age group. Having a sleepover? We've got you covered with Slumber Party Games. Have you seen the game called Cahootie? Perfect for the tween set! It is a fun way to start your party. 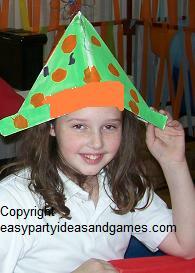 Large Group Games Perfect games specially designed for groups! Games just for girls that will guarantee lots of giggles. Who doesn't love to be pampered. A Spa or Makeover Party is sure to be popular! For glitz and glamour, and a very fun theme, try a Hollywood Party. Another top pick for tween party ideas is the Luau Party. Great to team up with a swimming pool party, but doesn't have to be around water! For a wild and crazy time, plan a Backwards Party. Another one of the favorite ideas for tweens and teens are Scavenger Hunts. We have some great ideas to get you started. Adapt your favorite game show to your party them at a Game Show Party. Don't want to have it at home? Then, think about using some ideas for Destination Parties. A Craft or Art Party, Beading Party or Scrapbooking Party will let you bring out your creative side.